Mr. Charley, an accordion-playing mime, allows festival goers access into what looks like an out-of-order photo booth but in fact, is a passage way to The Poetry Brothel, providing one-on-one readings in multiple back rooms in The Hangar, a new stage at Electric Forest on Thursday, June 25, 2015. Poets as “whores,” each operate within a carefully constructed character, who impart their work in group readings, spontaneous eruptions of poetry, and most distinctly, private, one-on-one poetry readings. The festival at Double JJ Ranch in Rothbury Mich. continued through June 28. Miss Saginaw County Danielle Purtell smiles backstage as she chats with other contestants during the second night of the 2015 Miss Michigan Scholarship Pageant at the Frauenthal Center for the Performing Arts in Muskegon, Mich. on Friday, June 19, 2015. 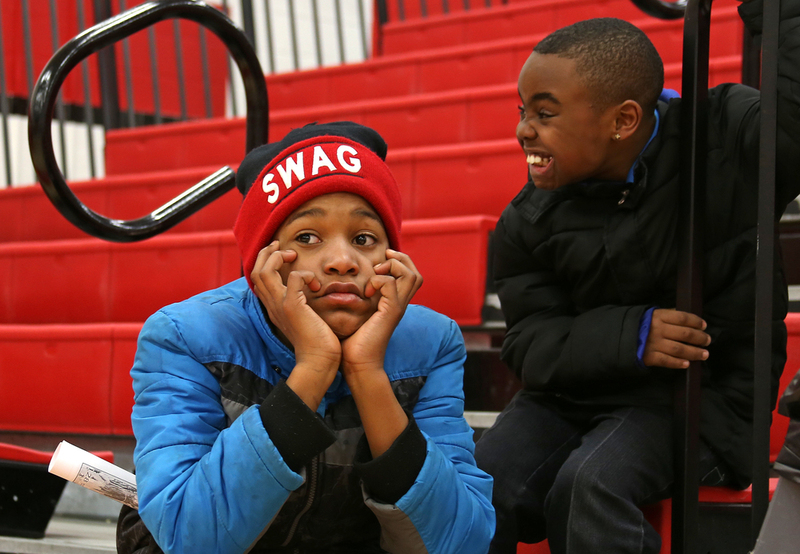 Muskegon Heights Academy fans, Dajuan Garrett, 11, center, and Jamarion Diggs, 9, right, watch the North Muskegon team warm-up on the court before their Class C boys basketball district championship game against Muskegon Heigths at Kent City High School. From the rocking chair in her living room, Deloris Pohl, 89, looks off into distance. “He was going out to the car the other day and his knees were giving out on him and I was afraid he was going to fall and I said ‘Howard Pohl don’t you dare fall on me because I can’t get you up,'" said Deloris. "And then I keep thinking, well if I fall and get hurt, whose gonna.. you know, so I have to do a lot of things with a grain of salt." Alyse Solomon, a junior and intermediate Hunt Seat rider for the Central Michigan University Equestrian club team, buttons up her show jacket as she gets dressed for her first show of the season at Woodbine Farms in Chelsea, Mich. on Sunday, Oct. 4, 2015. Hunt Seat is a style of forward seat riding. “You use your core muscles as well as leg muscles no other sport targets,” said Solomon. While sitting on the edge of his bed, Edwin Silva, 22, of Westland speaks about his situation as he battles to become an American citizen. Silva was detained by ICE on July 23, 2015 after receiving a DUI which prevented him from renewing his visa.